This falls under the just-because-it’s-about-geographies-doesn’t-mean-it-should-necessarily-be-visualised-as-a-map category. 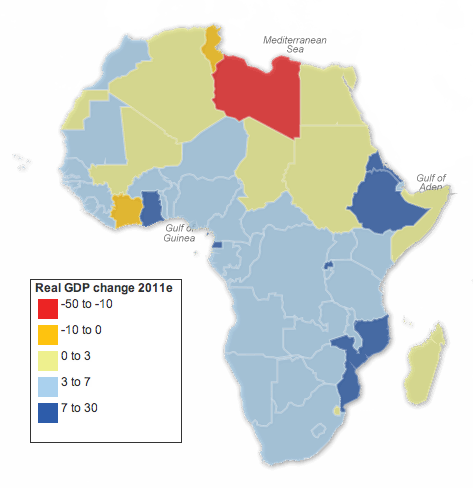 The Guardian has taken data from the African Economic Outlook, specifically real GDP growth rates, and charted them as a map. This caught my interest initially because of some work I have been doing that required me to read a report on African economic development in coming years. So I figured this could be interesting. But it’s a map. That’s not to say there is anything inherently wrong about the map. Though the arrangement of the legend and size of each ‘bin’ of percentage values is a bit odd. I would have placed the positive at the top of the list and tried to provide an equal distribution of the data, e.g. 3–10 for both positive and negative values. 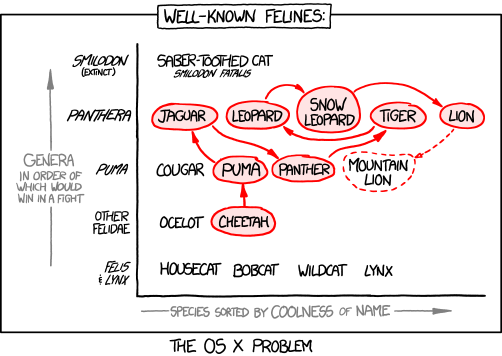 But, without looking in any depth at the data, the designer may have had valid reasons for such a distribution. That said, two finer points stick out to me. The first is Western Sahara. Long story short, it is a disputed territory claimed by different factions. I am not accustomed to ever seeing any real economic data coming out of there. But, according to the map, its growth is 0–3%. When one looks at the data, however, one finds that as I would have expected the data says “no data”. Ergo the green colour on the map is misleading. Not necessarily incorrect, for the growth could have been between those two points, but without any data one cannot say for sure. The second concern for me is South Sudan—remember that story? For starters one cannot find it on the map; South Sudanese territory is depicted as part of Sudan. While South Sudan is one of the poorest countries on the earth, its split from Sudan is rather important. Looking at the data, one can see Sudan’s growth went from 8 to 4.5 to 5 to 2.8. Why the sudden drop? Probably because Sudan’s economic boom has largely been built on the boom in oil prices over the past decade or so. But, most of that oil is no longer in Sudan, Not because its been pumped dry, but rather most of the oil fields can now be found in South Sudan. These are some of the contextual stories that make sense of a data set. 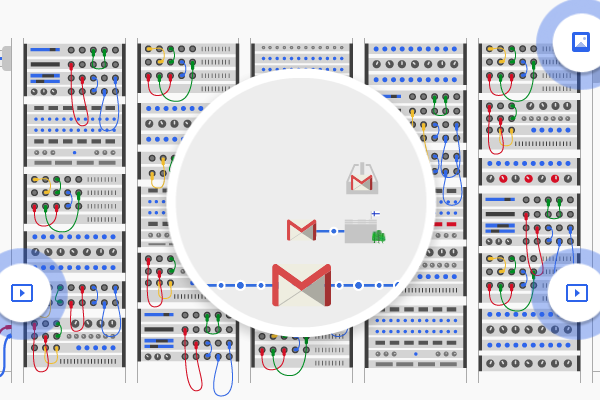 But these are the stories lost in a simple, interactive map. Credit for the piece goes to Nick Mead. Choose Your Own Adventure. Greek Debt Crisis Style. The Eurozone. Greece. What a complete mess. And that’s just what has happened. What about what’s next? If you are confused about how the debt crisis in Greece and the Eurozone will unfold, you are not alone. Thankfully, the Guardian has posted an infographic, more precisely an interactive flowchart, to help us sort out the mess. 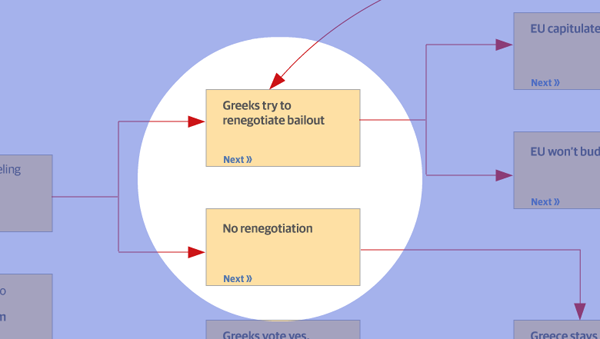 Now you get to choose your own adventure for Greece and the Eurozone. Credit goes to Paddy Allen for posting, but it appears as if Lombard Street Research deserves the credit for the piece. But I might be mistaken. Author Brendan BarryPosted on 25 May 12 11 November 16 Categories InfographicTags diagram, economics, flowchart, Guardian, infographic, information design, interactive design, politicsLeave a comment on Choose Your Own Adventure. Greek Debt Crisis Style. Have you ever wondered if you’re working too much? Thanks to an interactive infographic from the BBC, now you can see whether or not you are. At least in comparison to the rest of the OECD. 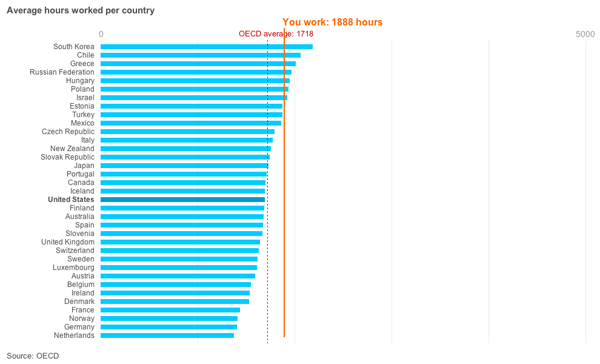 The user enters an average number of hours worked per week and then their total number of holidays (including public holidays) and see a comparison of their hours spent worked against those of OECD member countries. Author Brendan BarryPosted on 24 May 12 11 November 16 Categories InfographicTags bar chart, BBC, charting, data visualisation, demographics, economics, infographic, information design, interactive designLeave a comment on How Much Do You Work? The Globe and Mail has been working on a story about immigration to Canada because apparently not all immigrants come to America. 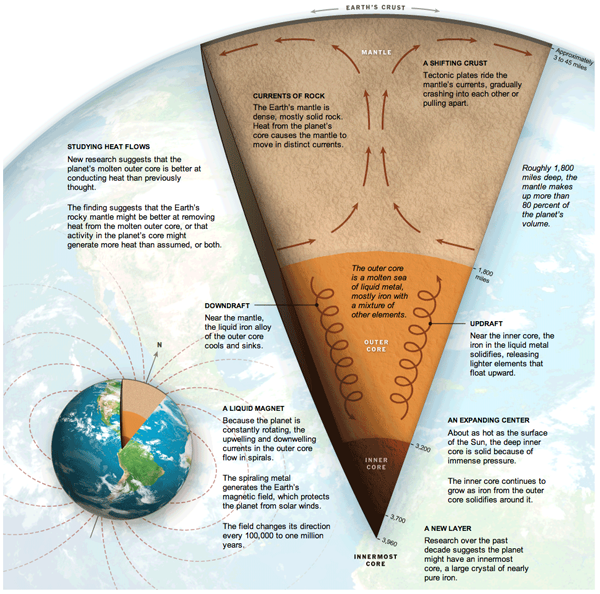 The story has its section headers running down the side column of the page, like many other segmented stories you’ll see posted online these days, but also uses graphics to make and supplement its arguments. This one chart from the piece is an example of how the simple format of a line chart can clearly express and visualise an interesting trend. Immigrants from the past two decades earn less than immigrants to Canada in the 1970s. Those from the early 90s, however, do appear to have a faster rate of income growth that approaches parity with Canadian-born income-earners. On Sunday the New York Times featured a small graphic highlighting the disparity in growth rates across the G-20 if broken into the ‘core’ G-8 and then what one might call the emerging markets of the G-11. The charts are small yet compelling in telling the story of how the two different groups are performing. However, I was left wanting to better understand the comparisons between the sizes and growth of the various countries. The areas of circles are difficult to compare and aggregates mask interesting outliers. So, using what I imagine to be the same data from the IMF, I took a quick try at the data to create my own infographic. Indeed, interesting stories began to appear as I plotted the data. Russia is a member of the G-8, but perhaps has more in common with the G-11. After all, Russia’s growth was nearly 500%. Similarly interesting were Canada and Australia. The former, a G-8 country, was the only G-8 country besides Russia to have greater than 100% growth. And Australia, certainly not an emerging market in most senses, experienced nearly 300% growth. 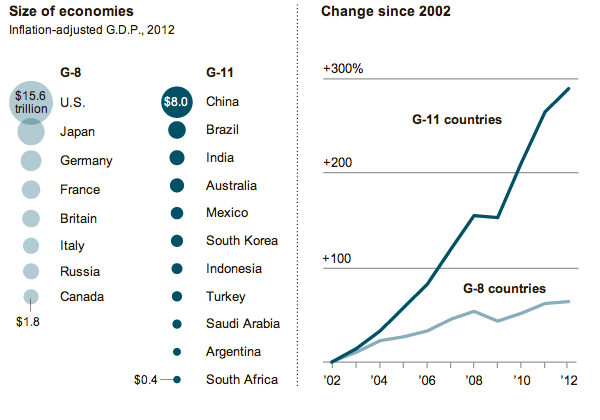 Whereas the emerging markets of Mexico and South Korea lag behind the rest of the G-11. Then, when plotting the sizes of the economies, China was no surprise as the second-largest economy. 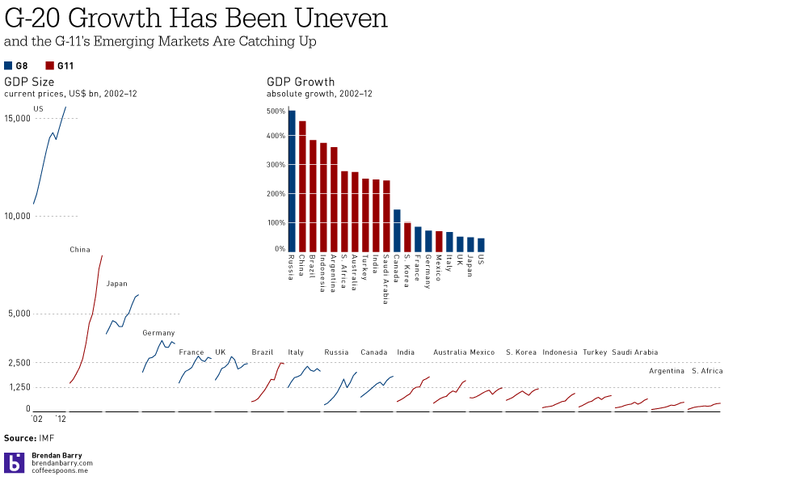 However, that Brazil has managed to already surpass the G-8 economies of Italy, Russia, and Canada was a bit shocking. And Brazil looks nearly ready to surpass the UK, but for its apparent recent downturn. Also interesting to note are the Financial Crisis dips in GDP across most countries. Some countries, like China, unsurprisingly did not suffer greatly. However, that Japan and South Africa kept on a steady pace of growth was unexpected. All of that would have been missed but for a slightly deeper dive into the IMF data. And a few hours of my time. You might recall that back in January an Italian cruise ship sank after striking submerged rocks. In case you were wondering, the ship is still there. But the plan is to refloat the ship and then tow it to a harbour on the Italian mainland and scrap the ship. 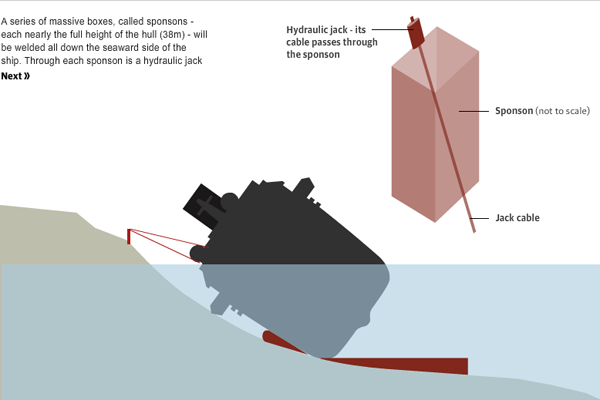 The Guardian put together a nice interactive infographic explaining just how the process will work. Credit for the piece goes to Paddy Allen. Animals need to reproduce. 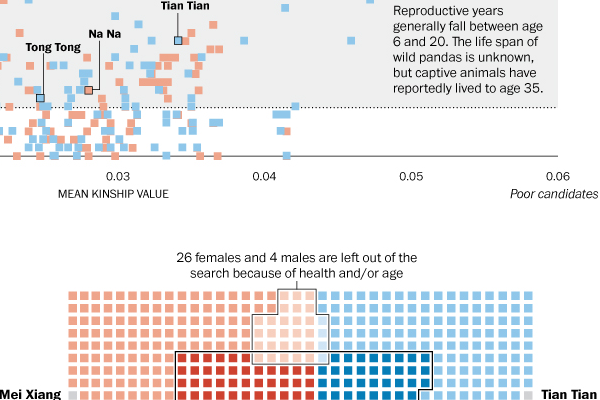 Well, except perhaps some of our own species…and so today’s infographic from the Washington Post looks at the birds and the bees. Or rather the pandas and the pandas. Or is that the pandas on pandas? Regardless, the reader can see that panda mating is not easy. Credit for the piece goes to Cristina Rivero.